I was in high school when Hellraiser (1987) was released. Although I was seeing a lot of movies in those days, I do not recall hearing about it at the time. Maybe it never came to the movie theater in the small town where I lived or had a trailer included in any of the other films I saw at the time. I first heard about it from a friend in college, and a small group of us rented it one night to watch in a crowded dorm room. It blew me away and remains one of my go-to examples of a film I've always liked even though I'd have trouble considering it one of the true greats of the genre. 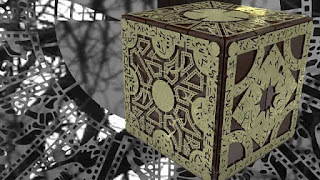 Even compared to other horror films being released at the time, Hellraiser had something of a b-movie vibe to it. It did not look nearly as polished and professional as many of the others, and the acting was merely adequate. Fortunately, this seemed to work here, lending some added realism. The low-budget feel was one of the things I liked about it (not unlike The Evil Dead). The story was simple but compelling, and the same could be said for the set. In addition to a creepy atmosphere and a great sense of dread, what Hellraiser really had going for it was the originality. I had seen plenty of horror movies, but I had never seen anything like this. I wouldn't say that it was much scarier or more disturbing than other films I had seen (although it held its own in these areas), but the tone was darker and more serious. It was like a nightmare coming to life on screen. We did not wait long to get out hands on the sequel, Hellbound: Hellraiser II (1988), and it did not disappoint. I've always preferred the first film, but this was a good example of how to do a sequel. The world of the Cenobites was expanded, and Pinhead received more screen time. Fortunately, they managed to accomplish this without making most of the mistakes that are so common in horror sequels. Unfortunately, they would save all of those mistakes for the next entry in the series. As far as the original Hellraiser trilogy, there is little question that Hellraiser III: Hell on Earth (1992) was the weakest entry. I saw this one in the theater during college on a first date. Good date; bad movie. It seemed as though the filmmakers had decided to abandon much of what made the first two films so good and to turn Pinhead into the next franchise villain. While I suppose this could have worked if it had been handled differently, they went in such a cartoonish (think Freddy Krueger) direction that it doomed the series. Although Hellraiser III was a let-down, it was still far superior to any of the films that followed it, most of which were released direct-to-video. Hellraiser III was not as good as the first two films, but it was at least entertaining. It is where the franchise should have ended. I must be a sucker for punishment because I watched all the subsequent films through Hellraiser: Hellworld (2006), even though each was worse than the previous one. Hellworld was so bad I decided that was enough. When I heard that they were re-casting Pinhead for Hellraiser: Revelations (2011), I took that as confirmation I had made the right choice. Unable to stay away for long, I did eventually watch Revelations, kicking myself for doing so. It was bad. That just leaves Hellraiser: Judgment (2018) as the only one I haven't seen. If I do ever give in and see it, I will do so with very low expectations. Over the years, I have periodically heard rumors of a remake of the original Hellraiser, likely as an attempt to reboot the franchise. I hope this does not happen. The original film may be dated, but I have trouble imagining that a remake could capture what made it so good. I consider the Evil Dead (2013) remake to be one of the better modern horror remakes, but it did not come close to capturing what made The Evil Dead (1981) so compelling. Given the choice, I'd much rather see the original. I am reasonably sure I'd feel the same about Hellraiser.